As UK agent for Wyler’s extensive range of inclination measurement instruments, Bowers Group has recently supplied an advanced Wyler Blue Level Inclinometer System, to the Engineering Technology Group. The highly accurate Levelling System is now being used to ensure the precise assembly and meticulous installation of the busy group’s Machine Tools at customer’s premises. Consisting of Nakamura Tome Turning Technologies UK Ltd, and Chiron UK, who supply a range of moving column vertical machining centres; Handtmann, a specialist in high capacity machines for the aerospace market, and Feeler Machine Tools that are produced by Fair Friend, who are the largest machine tool manufacturer in Greater China. The Engineering Technology Group is currently enjoying high-levels of sales throughout the UK. Explaining the reasons behind the Groups recent purchase, Ian Howlett, Engineering Technology Group, Engineering Manager said: “As the Engineers at our Germany principle, Chiron GmbH have enjoyed such a positive experience with their Wyler equipment, they recommended the use of this advanced levelling and inclinometer system to us. “Following a successful demonstration, we were happy to purchase the Wyler Blue system. We are now using it to level our large milling machines in a dynamic mode to ensure the highest standards of machine installation. So successful has our use of the Wyler equipment been we are now looking to expand the kit’s use over our entire machine tool range. “Our engineers report that the Wyler equipment is extremely easy to use, and that as it is so flexible, many further uses are constantly being found for it. 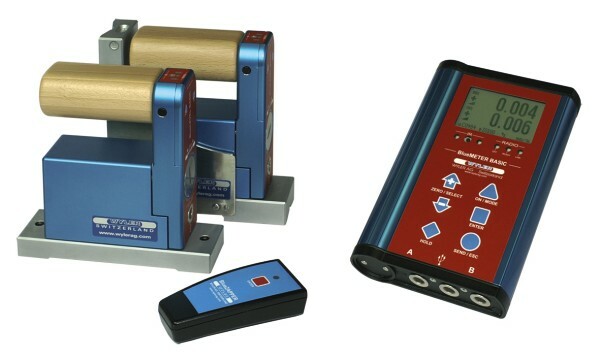 As the remote Wyler levelling modules feed information ‘wirelessly’ to a hand-held digital display, instant feedback relating to the elements being measured is available in real time to our engineers. This rapid feedback negates the need for the engineer using the equipment to access each area of the machine tool under measurement. Rapidly gaining favour within the global Machine Tool Sector, the innovative Blue levelling system is becoming one of the best selling products within Wyler’s comprehensive range. Although universally applicable, typical uses for the cost effective Wyler Blue System include accurately checking and setting the precise angular relationships between Machine Tools’ elements when being manufactured and installed. Further uses are the calibration of granite and cast iron surface tables and the inspection of angular relationships and parallelism of large fabrications. Key features of these compact, precision instruments include a large LCD display, the availability of units with 3 sensitivity settings of up to 1 µm/m and the option of wireless data transmission based on the internationally approved Bluetooth™ standard. The robust Wyler system comes into its own when used within the kind of harsh environments not suited to other manufacturers’ less rugged equipment. All sets feature output options to enable the easy printing of reports, calibration certificates and the connection to a PC running Wyler’s easy to use evaluation software. For more information on Wyler inclination measurement instruments, click here.